We are pleased to announce our newest addition to our industry speakers, Dan “Shoe” Hsu. 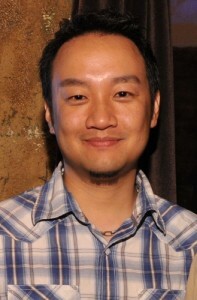 Dan “Shoe” Hsu is an 18-year veteran of the gaming press. He’s appeared in or on Electronic Gaming Monthly, 1UP, G4, CNN, NPR, Bitmob, VentureBeat, CNBC, ABC Radio, and more. During that time, Shoe has seen and coordinated every type of pitch, from the desperate pleas of a one-man indie developer to a worldwide exclusive debut of a triple-A, monster-budget sequel. Currently, he manages the Partner Alliance, Developer Relations department at Sony Computer Entertainment America, helping to support indie and free-to-play PlayStation developers through co-marketing. We’re pleased that Dan will be bringing his years of experience, both in independent and AAA games, as well as industry press to the developers at Vector. Remember, you can buy your tickets still for early bird pricing until February 15! We are pleased to announce our second keynote speaker, Lisa Brown! 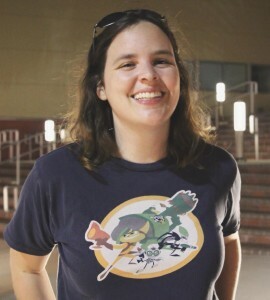 Lisa Brown is an independent developer and the current Game Designer in Residence at Harrisburg University. She was formally a game designer at Insomniac Games and a graduate of Carnegie Mellon University’s Entertainment Technology Center. Since going indie, she has released several experimental personal games (Imaginal, Lisa vs. the Tornado) and livestreams game development and game design analysis to help others get better at making games. Lisa loves advising students, participating in game jams, and exploring alternative control schemes for games. Lisa has a pretty awesome website, where you can check out her games and Patreon and see all of the cool stuff that she’s into. We’re super excited to have Lisa joining us for Vector this year! Remember, you can buy your tickets still for early bird pricing until February 15! 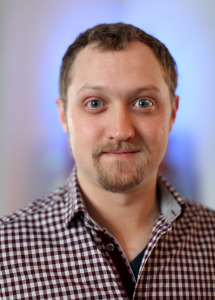 Vector is pleased to announce that independent game designer Jerry Belich will be one of our keynote speakers! Jerry will also be working this semester as the Vernon Wilson Endowed Chair of Game Design at Eastern Kentucky Universities Gaming Institute. You can read more about that on the EKU Gaming Institute’s blog post. Jerry Belich is an alternative game designer, using hardware, electronics, and software to create immersive interactive and storytelling experiences. He went independent in 2013 after a decade of professional software development, now consulting for other indies and companies in game design, narrative writing, and installation work. His first hardware project, the award winning Choosatron, has traveled all over the world, featured at dozens of events, and sparked imaginations all along the way! He plans on continuing creating his own inventions and games, and hopes to help many others to do the same through his talks, workshops, and through openness of his own work. We are very pleased that Jerry will be joining us at our April 30th event, and are incredibly excited that he will be spending time with the students at EKU! We are excited to announce that Early Bird tickets are currently available! If you’ve been watching updates for Kentucky’s game developers conference and thinking “oh man, I have got to go to that” then check out our tickets! These tickets are for a short time only. After February 15, we’ll be changing to regular price admission. So if you want to get in while the going is hot and get your advance tickets, you can use that fancy Eventbrite ticket button above or click here. We could not be any more excited about our upcoming April 30th convention, and we hope that you are too! We’re getting ready to announce speakers, so keep your eyes peeled and your ears open. Have you ever been stuck at the booth when a great talk happened? Ever wished you could spend more time networking with other developers instead of chilling at a booth? Great news everyone! We have a demo space for developers to showcase their games! Part of the plan for Vector is to get developers away from the traditional expo-floor conference. While there are options to sponsor the event (or to participate in the Student Showcase) there is another option available for developers who would like to showcase their game to other developers at Vector. Vector will have a free demonstration room with televisions and a system in place where, on the day of, developers will be able to sign up and show their game for a short period of time. This set-up is designed to be both casual. By supplying televisions, traveling developers will not have to transport their own demonstration stations. While attendees should plan to bring their own laptops and gamepads, Vector will supply the televisions and connecting cables as well as a small cache of wired Xbox 360 controllers. Are you a Kentucky student? Do you make games? Be sure to submit your game to our student showcase. For this upcoming event, we are hosting a student showcase. This student showcase is open to any student in Kentucky who has made a game. Applicants must be a current Kentucky student or have graduated within the last 6 months. Selected games will be given booth space at the game developers conference to showcase their work and a representative must be present at the showcase, April 30, 2016. Submissions must be made by Sunday, March 20th, 2016 at 11:59pm Eastern Time. Please submit your entries through our Student Showcase form.